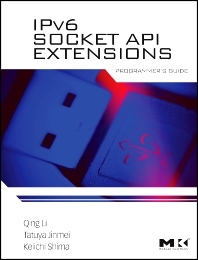 IPv6 Socket API Extensions: Programmer's Guide covers the IPv6 application programming intercfaces (API) extensions and enhancements that have been made to the socket APIs. The book begins with a brief overview of the API specifications along with sample code usage. Then an explanation of the internal kernel implementation that realizes the services offered by the API sets is detailed. Also descriptions of several standard user libraries that have been extended or created to support IPV6 are reviewed. Includes various examples which illustrate how to write portable applications that can run on either IPv4 or IPv6 networks. Succinct treatment of everything you need know to get up and running with IPv6 socket programming in one affordable volume. Software developers, network programmers, and systems programmers who want to learn about and implement IPv6 Sockets APIs and related protocols in a network environment.